Region play in underway throughout much of the state, at least the part that plays in seven-team leagues. As the official race for postseason positioning began, there were some great region openers. There were also some fantastic performances in non-region contests. As we look at the players who stepped up on Thursday and Friday nights, here are some notable performances. Let us know about the big plays and players we did not get on our list…. The game of the night Friday night was a region opener between 5A newcomer Mountain Crest (4-0) and Region 1 holdover Fremont. It took three overtimes for the Mustangs to earn the 37-34 win as Tanner Schwab hit Wyatt Bankhead for a 25-yard score after the Silver Wolves settled for a field goal in that third extra session. Schwab was 28-of-41 for 325 yards and four scores for the night. In the only battle of the week between a pair of unbeaten teams, Springville’s Sai Atiifale blocked an extra point in the final minute to preserve the Red Devils’ 14-13 win over Maple Mountain (3-1) in the Region 8 opener for both teams. 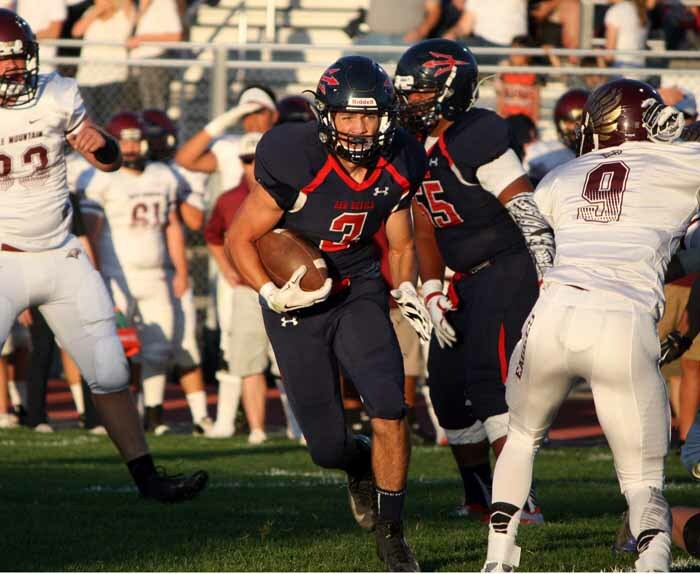 Two-way performers Bryce Nelson (114 rush yards, nine tackles) and Adam Rodriguez (two rushing touchdowns, six tackles, two sacks and three quarterback hurries) led the way for Springville (4-0). A 41-31 win over Northridge allowed Olympus to level its record at 2-2 as senior Quinn Meier carried 33 times for 251 yards and three touchdowns. Meier also caught four passes for another 68 yards, and his highlights included a 65-yard TD run and a 41-yard scoring reception. Murray improved to 3-1 with a 28-7 win over previously unbeaten Juan Diego. The Spartans had the Maxs Tupai and Hunter Jones show on full display. Tupai totaled 12 tackles, including five tackles-for-loss and three sacks while Jones paced the offense with 239 yards and three touchdowns on 17 carries. Lone Peak (4-0) remains one of the favorites in Class 5A as the Knights rolled over Pleasant Grove to begin Region 4 play while picking off four Viking passes. Lone Peak quarterback Talmage Gunther completed 15-of-20 passes for 181 yards and four scores, and he also ran for 70 yards on 11 carries. Jordan (4-0) continued to roll offensively in its 62-18 win over Taylorsville as Alec Evans ran for 125 yards and three touchdowns, while also posting 67 yards and another score as a pass catcher. In that same contest, Jace Simons led the Warriors with four receptions for 159 yards and two touchdowns. Brighton (4-0) also remained perfect on the season as Sione Lund delivered on both sides of the ball, with 128 yards rushing and 13 tackles in the Bengals’ 24-6 win over Cottonwood. 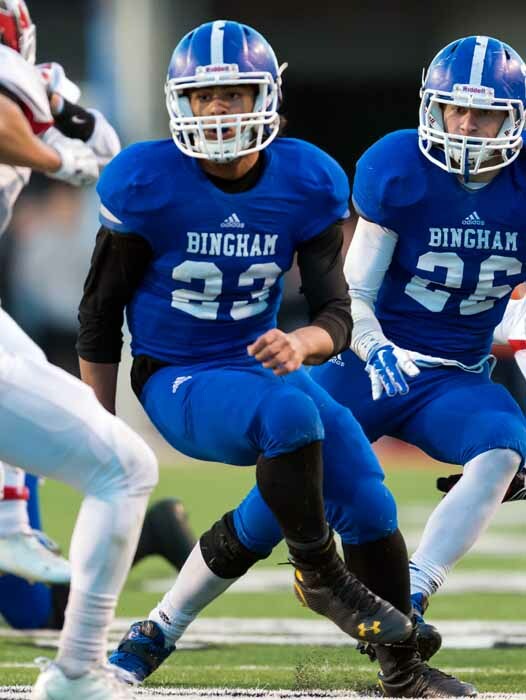 Bingham (3-1) finally got its scoring offense untracked as the Miners took care of West Jordan 57-13 in Region 3 play. Brady Atkin scored a touchdown on the ground and another by way of a 99-yard kick return, while Jahvontay Smith scored twice in the running game. Lehi sophomore quarterback Cammon Cooper was a big story once again as he passed for 346 yards and four touchdowns in the Pioneers’ 41-34 victory over Riverton. Carson Terrell caught two of those scoring passes as part of an eight-reception night on which he went for 157 yards. The Lehi defense was led by two interceptions from Lincoln Bunker. Kahi Neves had a huge passing day for Timpview (3-1) to a 35-14 win over Alta as the two Region 7 newcomers opened league play. Neves completed 25-for-33 for 363 yards and two touchdowns to lead the Thunderbird offense, while defensive back Will Watanabe paced the defense with 17 tackles and an interception. San Juan blitzed Summit Academy 41-14 in a non-region battle as it sacked Justin Miller 10 times, led by three from Reilly Myrick and 2.5 by Peter Shumway. In that game, the connection of Miller to Darrin Gethers was prolific as the passer hit on 28-of-45 for 318 yards and a pair of scores, while Gethers added to a seven carry, 58 yard rushing night by catching eight balls for 131 yards. A 54-0 win over South Sevier allowed South Summit to improve to 4-0 overall. The Wildcats were led by touchdown runs of 13, 14, 30 and 31 yards from Isaac Tillett and a 60-yard scoring catch by Nicholas Beasley. Nate Honey ran for 111 yards as American Fork (2-2) beat Westlake 24-17 to open play in Region 4. Davis (4-0) kept its unbeaten season going with a 27-21 victory over Viewmont, as Griffin Hill caught four passes for 152 yards and scoring plays of 43 and 80 yards. Sky View (4-0) continues to have the look of a contender in Region 1 as it took care of Weber 36-13 to open league play. The Bobcats got nine tackles and three sacks from Max Christensen to pace the defense and four receptions for 81 yards and two scores from Bryce Mortensen to lead the offense. 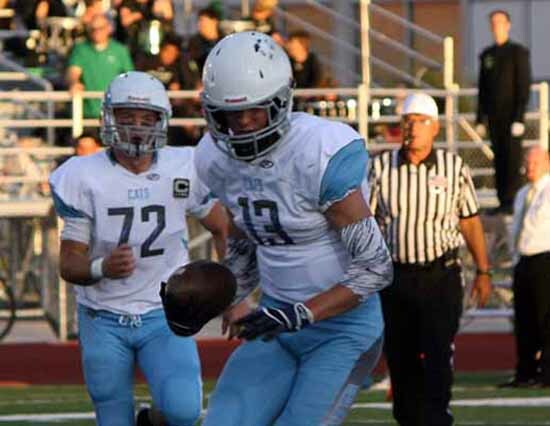 Another team transition from 4A to 5A in Region 1, Roy (2-1), also opened with a league win as the Royals topped Clearfield 44-8 as Trace Tupe had a 60-yard interception return for a score and Tyler Eteuati took a punt back 83 yards for a score. Scoring all of its points in the first half, Syracuse (2-2) took care of West 42-0 as quarterback Chase Bauerle completed 12-of-16 passes for 206 yards and three scores. He also ran for 30 yards and scored a touchdown in the ground game. Kade Trowbridge scored four touchdowns as Wasatch (3-1) claimed a non-region win over Skyline Friday night. Trowbridge scored on receptions of six and 26 yards, ran one in from three yards out and scored on an 85-yard kickoff return. Five different Provo defenders picked off passes as the Bulldogs improved to 4-0 with a 34-0 whitewashing of Mountain View in a Region 7 opener. Provo scored 20 points in the fourth quarter as it pulled away from the Bruins. 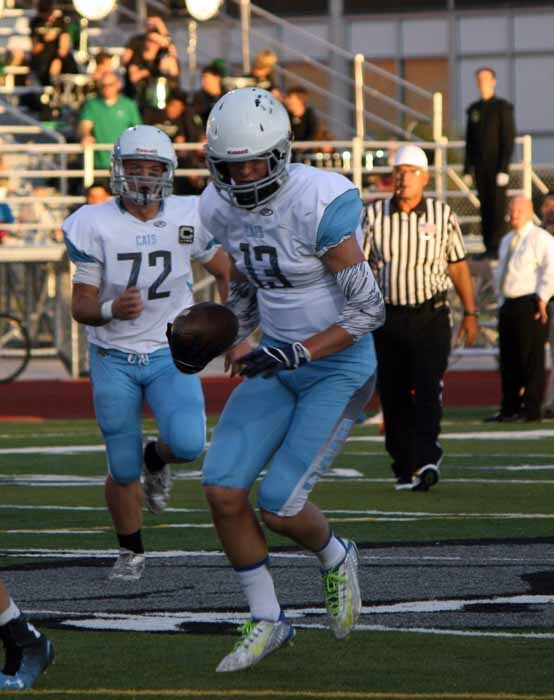 In another Region 7 opener, Corner Canyon (1-2) picked off its customary four passes (the Chargers have had four interceptions in each of their three games this season) as it picked up its first win of the season at Orem 31-14. The Bonneville (1-3) defense sacked the quarterback six times as the Lakers took care of Woods Cross in a Region 5 contest. Senior quarterback Braxton Wright was 23-of-37 for 261 yards and a touchdown for Bonneville, with 12 of those tosses connecting with Tyus Peck, who went for 152 yards receiving while catching that TD pass. Kobe Beatty intercepted a pass for the Lakers and took a 96-yard kick return to the house. Snow Canyon (3-1) picked up a 45-0 victory over Ogden as T.J. Taimi picked up 124 yards of total offense and Tyson Harvey returned an interception 78 yards for a score. Union (2-2) played outside of its region, picking up a 41-18 victory over Richfield, as quarterback Vil Lutui threw a pair of touchdown passes (20 and 28 yards) and ran in a pair of short scores from one and two yards out. Spencer Larsen ran for four first-half touchdowns (34, 14, 91 and 38 yards) in leading Morgan (3-1) to a 42-12 victory over Delta. A one-yard James Pembroke run in overtime lifted Highland (2-2) to a 14-7 win over Bountiful. Jayden Palauni had three sacks for the Rams. Junior Mac Stevens (11 carries, 165 yards, touchdown runs of 30, 40 and 76 yards) and senior Kayden Stevenson (11 carries, 133 yards, two TDs (including a 75-yard scoring run)) led the Manti (2-2) offense, while senior linebacker Jordan Howe (24 tackles) and senior defensive lineman Douglas Schiess (21 tackles) paced the Templar defense as they knocked off Emery 44-27. Former region rivals Dixie and Canyon View got together, and it was the defending 3AA champion Flyers coming away with the 55-42 victory, as Zac Harrah completed 14-of-26 for 344 yards and six touchdowns. Cedar (2-2) held on to top Juab 21-20 as junior Mason Fakahua combined 229 yards passing and 105 yards rushing and junior Jade Bulloch led the defense with 16 tackles and four sacks. Senior Jerome Fauatea ran it 24 times for 125 yards and three TDs while leading Hunter (2-2) to a 42-14 win over Layton. Spencer Applegarth (14 carries, 190 yards, two touchdowns and four receptions, 77 yards, touchdown) and Zac Lee (two TD runs and three TD passes, including aerials of 45 and 70 yards) were the stars as North Sanpete (2-2) took care of its business against Carbon 55-15. Junior Noah Vaea picked off two more passes for Herriman (2-2), giving him six picks for the season, as the Mustangs intercepted a total of four passes in their 41-7 win over Box Elder. A pair or Sione’s played a major role in Granger‘s huge 62-6 win over Cyprus. The Lancers improved to 2-2 as Sione Houma ran for three touchdowns, including a 46-yard scamper, and threw a 50-yard TD pass, while Sione Tauataina ran for a pair of scores, including a 66-yarder. Grand County (2-2) survived a 49-35 shootout with Gunnison Valley as senior Joseph Shumway ran 11 yards for 201 yards and five touchdowns. The two-headed running attack of Lincoln Powers (13 carries, 130 yards, TD) and Ryan Brady (18-106-1) lifted Tooele (3-1) to a 27-16 victory over Stansbury as the Stallions took their first loss of the season. Another battle in the 3AA North region saw Ben Lomond (3-1) top Park City 42-29. The Scots got offense from all over as Angelo Rios ran 27 times for 171 yards and three scores, while Deontay Nish had nine catches for 139 yards and two TDs and quarterback Kenyon Harris was 19-of-31 for 298 yards and a pair of touchdowns. 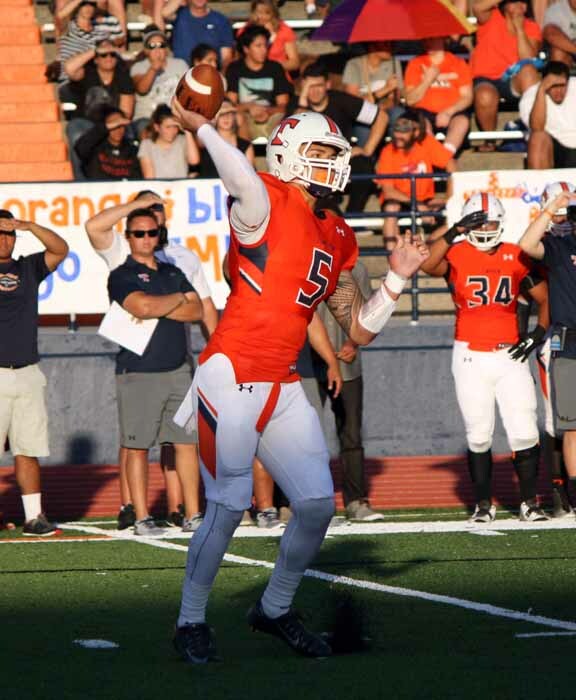 In that same game, Miner quarterback Spencer Zur connected on 28-of-53 for 444 yards and four scores. Logan got its 3AA North season off to a good start with a 38-12 win over Judge Memorial as Joshua Young nailed three field goals for the Grizzlies. 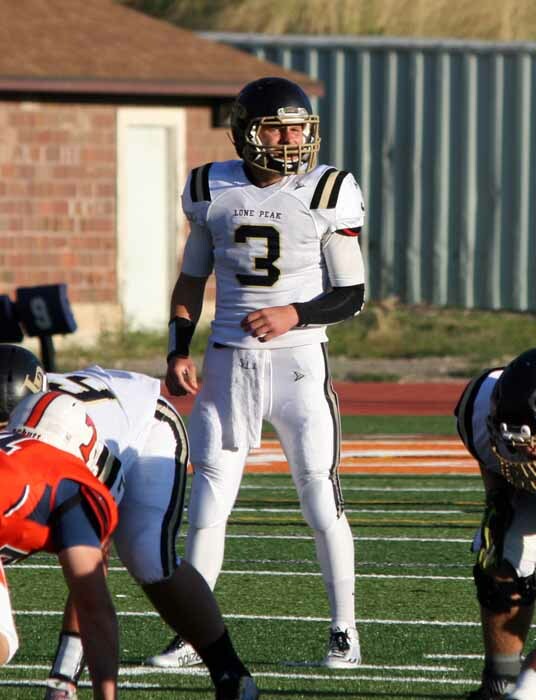 Quarterback Hunter Horsley threw a 25-yard touchdown pass and scored a pair of rushing TDs (five and 51 yards). Matthew Roberts passed for 129 yards, ran for 106 more and had two interceptions on defense in leading Beaver (3-1) to the 21-17 win over North Summit. It was the first win of the season for Bear River (1-3) as it knocked off Grantsville behind 28 carries for 133 yards from Gage Kaneko. American Leadership Academy (3-1) was led by 20 carries for 173 yards and two touchdowns from Owen Huff in its 34-14 win over North Sevier. Three rushing touchdowns and one receiving score from Tyson Colton were huge as Uintah moved to 1-3 with a 40-21 win over Payson. This week’s action began Thursday night when Kearns (4-0) continued its red-hot start with a 42-0 win over Copper Hills. Graden Luckhart caught a pair of touchdown passes and also threw a 66-yard TD pass to Shay Reid.